Archives : MID - CAPS RALLY - 27/12/2013. POSITIVE START TO JANUARY SERIES. The new series started on a positive note and in the process managed to close above the critical level of Nifty – 6306 and Sensex - 21134. This is a signal that the consolidation might be over and upward movement will resume soon. Also the mid-caps are showing good movement, which augurs well for the overall market. Market wide Rollovers were in line with the 3 months average. Strong Rollovers were observed in stocks like LIC Housing, Tata Global, JSW Steel and Tech Mahindra. 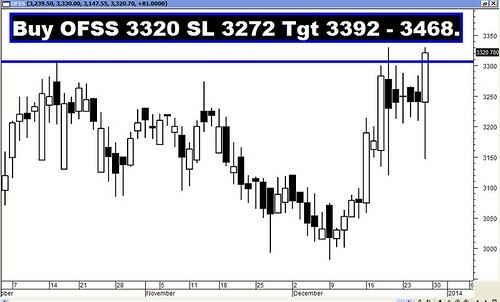 As the year draws to a close, Bulls seems to have bounced back and seem to be in good control. Sensex opened the week at 21080, made a high of 21235, low of 21010 and closed the week at 21193. Thus it registered a weekly gain of 114 points. At the same time the Nifty opened the week at 6267, made a high of 6324, low of 6259 and closed the week at 6313. Thus the Nifty closed the week with a gain of 39 points. On the daily charts, both Sensex and Nifty have made a small white body candle on the daily charts. This is a part of ongoing bullish consolidation pattern which will end when Nifty closes above 6317. On the weekly charts, both the indices have formed a small white body candle. Interestingly last two weeks white body candles are within the previous weeks black body candle almost like Falling Three Methods which is a bearish continuation pattern. But that is not the case here, as the pattern is being formed in an uptrend. Hence daily candlestick as well as weekly candlestick study point towards a bullish bias. Market had bounced back from the Support zone between Sensex 20651 – 20636 and Nifty 6142 – 6140. This support zone is due to the confluence formed by 61.8% Retracement (Sensex – 20651 and Nifty 6141) of the immediate rise and 38.2% Retracement (Sensex – 20636 and Nifty – 6142) of the intermediate rally. Correction will resume only if the Nifty falls below the low of 6129, and for that the Correction levels will be Sensex 20636-20374-20112 and Nifty 6142-6058-5973. Both the indices are in the process of completing a Flag pattern which is a Bullish continuation pattern. It will be complete only when Sensex closes above 21207 and Nifty above 6317. Accordingly the target will be Sensex 21846 and Nifty 6505. This week, both Sensex and Nifty have managed to stay above the short term average of 20dma (Sensex – 20946 and Nifty – 6238), medium term average of 50dma (Sensex – 20796 and Nifty – 6183) and also above the long term average of 200dma (Sensex – 19731 and Nifty – 5905). Thus the trend in the short term, medium term and long term timeframe continues to remain positive. MACD continues with its Buy signal and is in positive territory. ROC continues with its Sell signal as it is in negative zone. RSI (58) continues with its Buy signal, suggesting a continuation of bullish momentum. MFI (47) continues to remain below the equilibrium line, suggesting money flowing out. Stochastic Oscillator continues in Buy mode as %K (55) remains above %D. ADX is at a low level of 12, suggesting that the market is still in consolidation mode. The Directional Indicators continue in Buy mode as +DI is above –DI. OBV has started moving higher but is yet to give a Buy signal. Thus Oscillators are giving mixed signals for the immediate term. The Nifty O.I. PCR has reduced to 0.93. For the current series, highest Open interest build up has shifted to 6500 Call and 6200 Put. This suggests that the market expects a trading range with support coming in at 6200 levels and resistance around 6500 levels. Friday saw strong Put writing at the strike of 6300. Hence one can expect immediate support coming in at that level. The Trendline Resistance for the Sensex is at 21581. The Trendline Support for the Sensex is at 20749. The Trendline Resistance for the Nifty is at 6456. The Trendline Support for the Nifty is at 6193. For the week ahead, Sensex will find Support at 20867-20568-20203 and will find Resistance at 21483-21767-22048. For the week ahead, Nifty will find Support at 6212-6129-6030 and will find Resistance at 6415-6492-6571.